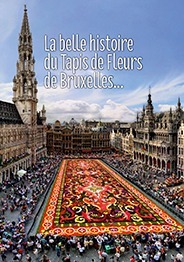 Art nouveau in Brussels is an undeniable richness and the this year Flower Carpet draws inspiration from it with talent and in harmony. A florid stained-glass pattern that will be inaugurated on 12 August 2004 at 10:00 PM, and visitors will be able to discover on August 13th, 14th, and 15th, from 9:00 AM to 11:00 PM, by visiting also the interior of the Brussels Town Hall, for €3.00 (children under 12 for free). Since its disappearance, the landscape architect has taken over with talent. The carpets of Brussels lace and the Gardens of Versailles have enchanted thousands of visitors since the year 2000. 2004 will celebrate Art Nouveau, its volutes and magnificent designs. The result will this year live up to all expectations: 1,800 m² of begonias compose this flowery and gleaming stained-glass pattern.